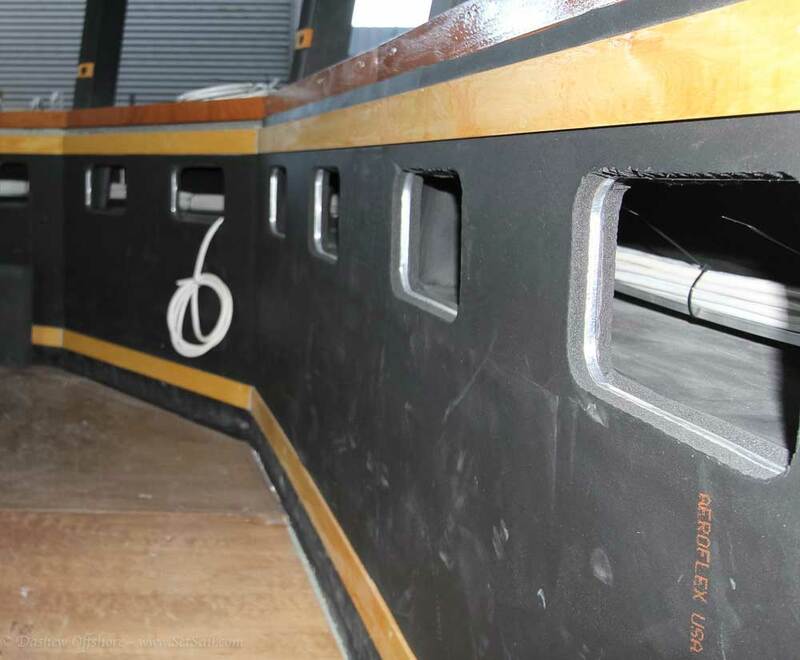 With mechanical systems installation wrapping up, and furniture modules being installed, the time has come to begin wiring on the first of the FPB 78s. 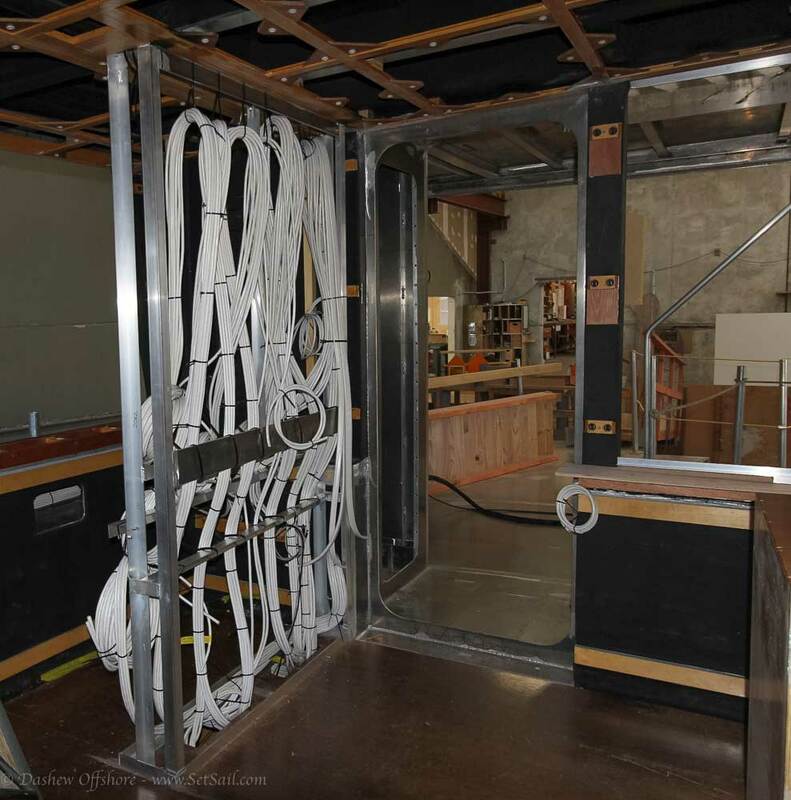 The lead photo is a small portion of the main electrical cabinet adjacent the entry door to the great room. Above we are looking at some of the wiring which leads inside the coamings to the great room helm. There will be in excess of six kilometers/four miles of wiring when this is finished. 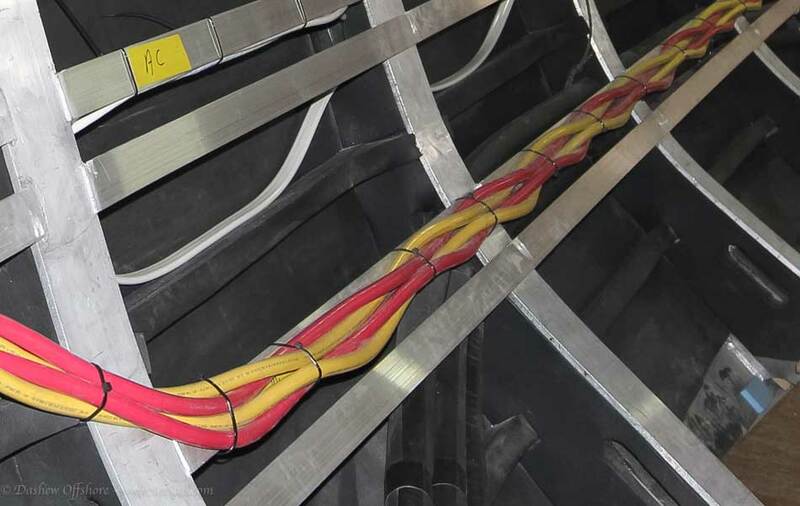 The heavy red and yellow cables, 4/0, are for the bow thruster, windlass, and foredeck kedging winch. There are a pair of 4/0 cables for positive and a pair for negative. The same holds true for the connections between the engine room alternator rectifier assemblies and the batteries. We are talking some serious amperage here folks, and minimized voltage drop, only accomplished with lots of wire, is highly desirable. Astute observers may wonder why these cables are twisted rather than being run in innate parallel lines. When you have parallel DC current carrying wire, it tends to set up magnetic fields. Big wire, big amperage, big magnetic field, which causes havoc with compasses. But if you twist them, as shown above, the twisted pairs of positive and negative cancel generation of magnetic force. Outback solar power controllers and a Victron autotransformer are mounted outboard of the stairwell between great room and accommodation deck. 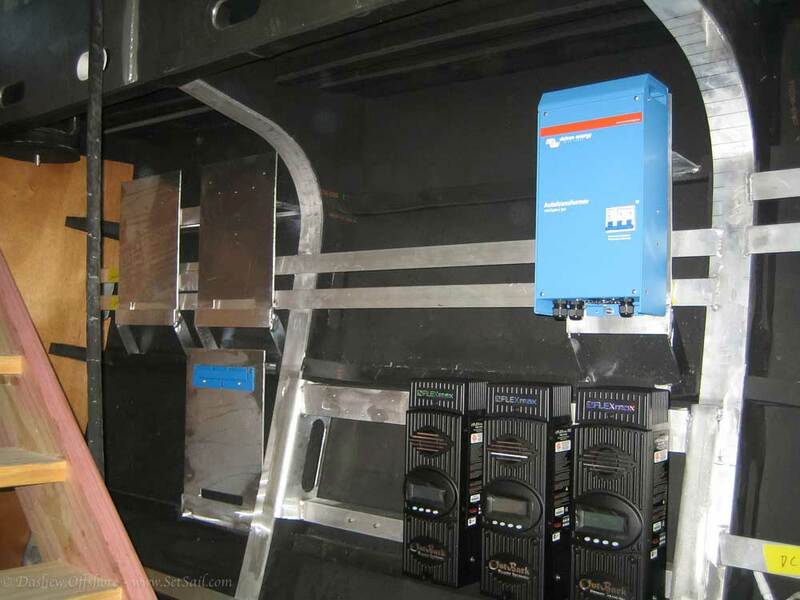 Three 5kW24V in/230VAC out inverter chargers will mount further forward. Note the space between these units and between them and the insulated hull. This is to insure airflow around this gear. Good airflow is required for efficient operation. You can see the dorade vent in the upper left corner of the photo. There is a 700 CFM extraction fan on this vent, should it be necessary to force cool the area. Same area as the preceding photo, only here with the solar controllers and auto-transformer removed. 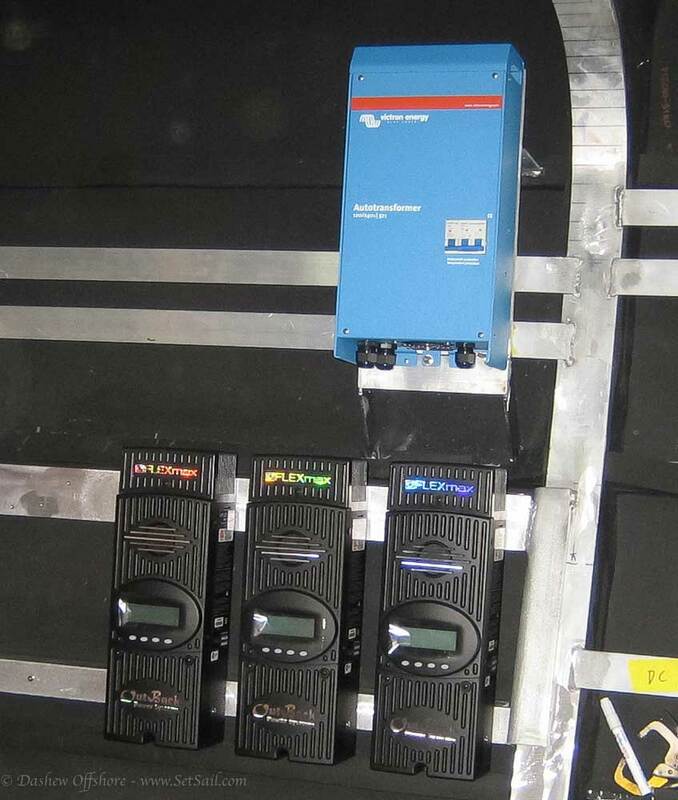 The gray box will house AC current components, in particular transfer switches. 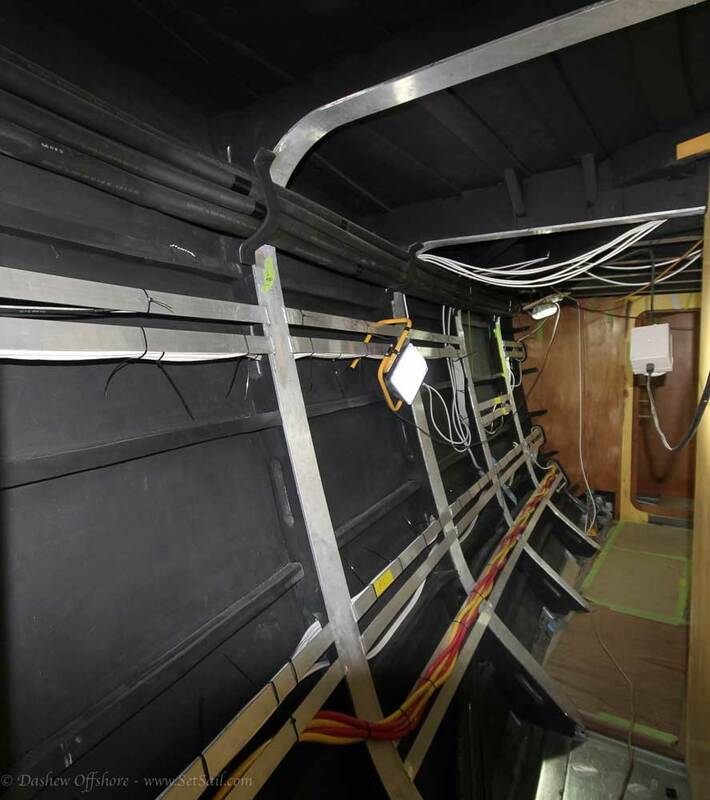 This wiring is running across the boat, under the great room sole, towards the galley. A watertight bulkhead penetration. This will eventually be sealed with a special foam. The area above the aft starboard stateroom shower, which feeds up into the great room electrical cabinet. 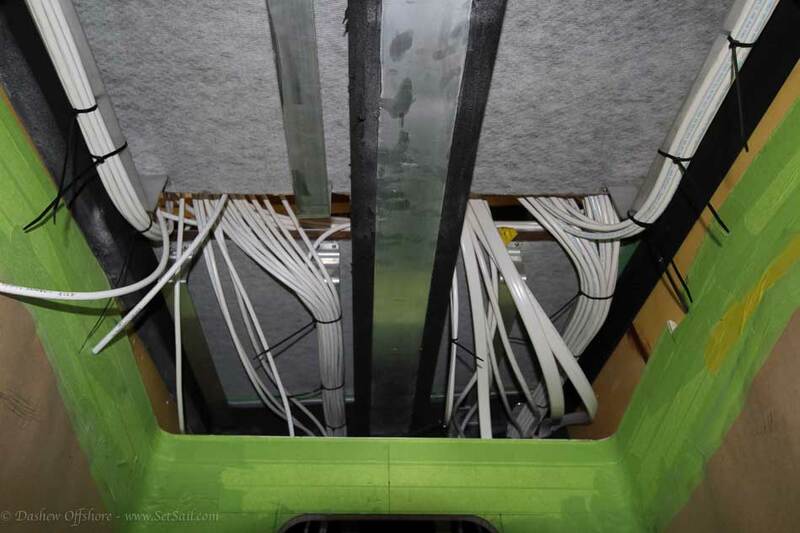 Combine these miles of wiring–the air conditioning and heating gear, fresh, gray, salt, sewage (black and grey) fuel and hydraulic plumbing, furniture, insulation, and structure–and you begin to see where this is a complex business. Integrating this into a holistic, and efficient, yacht is like playing three dimensional chess, only more difficult. This entry was posted on Monday, July 20th, 2015 at 8:55 am and is filed under Cruiser's Tech Talk. Both comments and pings are currently closed. 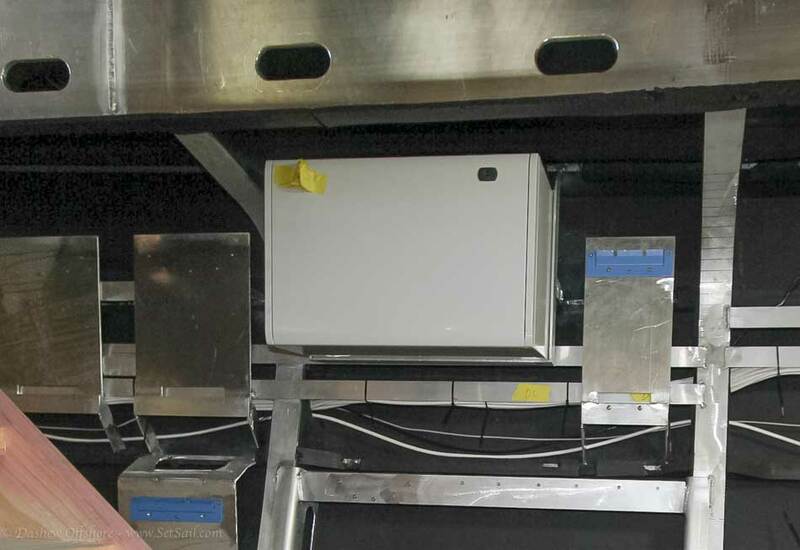 Why not utilize the latest distributed bus electrical systems like CZONE to limit the amount of wiring? We contiune to look hard at distributive systems. They offer cost, weight, and some functional advantages. But they are more vunerable to voltage spikes and lightning. WHich means we would need a mix of raditional direct power for mission critical systems and distributed for non-critical. At the end of the day the thing that drives us to say no more than any other is the difficulty in trouble shooting compared to a directly wired and swich system. Looks nice. 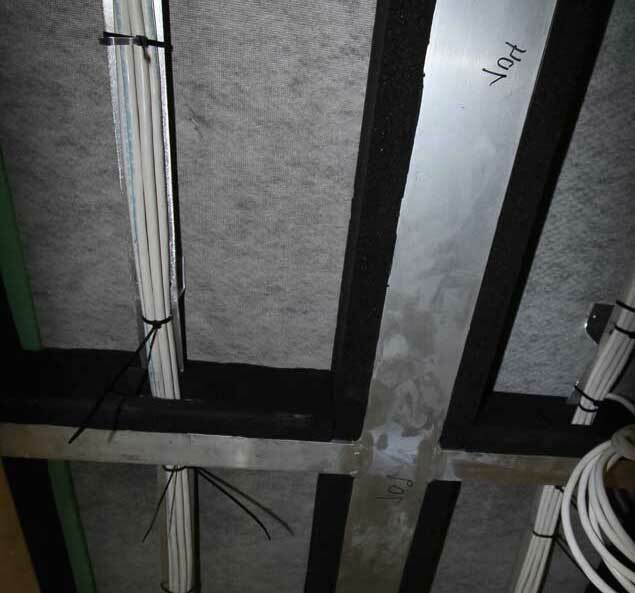 Have you had any issues with those Zip Ties chafing the electrical or other conduits? Looking forward to seeing the numbers from this solar set up. Zip ties have worked well for us over ten years and chafing as not been a problem. Regardless, that is a LOT of wire to manage. Is there a conduit or away to add wires in the future? Yes, Paul, there will be extra wires pulled now, and strings for pulling wires later. Hi Steve et al on your team. Been following quietly since way back in your Windhorse days and before that via your books such as my almost worn out copy of OffShore Crusising. I could not begin to tell you what a great teacher you and Linda have been and continue to be and how much it is appreciated and valued. Must be starting to feel a bit like being a young kid waiting for Xmas to hurry up and arrive as you and Linda watch your latest aquatic magic carpet take shape and launch day approaches so painfully slowly at times. A few questions for today and surely many more to follow as your time and patience allows. 1. Wondering if you could share your typically well thought out logic for deciding to stay with electrical rather than hydraulic for heavy duty items such as windlass, winches, bow thruster etc.? Given that you already have to provide hydraulic power for things like the stabilizers and the crash pump and the long runs you need to make such as in these photos for the high amp consumers on the bow, I am curious why you would have chosen not to go with hydraulic? 2. How are you fastening the wood framing grid for the ceiling panels to the aluminum framing? Adhesive, and if so what kind, or mechanical or a combination? 3. I’ve read in your answer to previous posts that you are attaching all the small wood blocks along the hull sides for the attachment points of wall panels and the like, that you are gluing these directly to the aluminum hull plating. What adhesive are you using? And given that you are going to such delightfully meticulous lengths to insulate these 78’s even better than the very snug 64’s to dramatically reduce your heat gain/loss and need for AC and heating and thus generator time, do you feel that the thermal loss and transfer via all these (admittedly small) blocks is insignificant? 4. Lastly for today, have you changed from using the perforated aluminum strips you used in the 64’s for fastening all the wire and hose runs? May just be these few pictures but looks like you are welding lengths of solid aluminum flat bar instead on the 78’s? 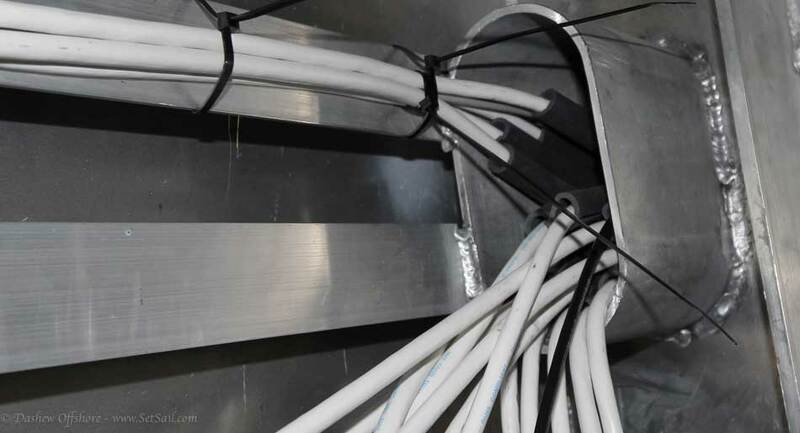 That perforated aluminum system (sorry don’t know the proper term)I’ve seen in the 64’s looked like a very tidy and adaptable way to securely hold all the wires and hoses with simple zip ties so curious if you’ve changed in the 78’s? Sorry for so many questions all at once Steve! Appreciate whatever responses you have time for. Short on time so brief replies, Carrying hydraulics forward brings noise with it and is heavier than electrical. For the windlass it means starting an engine at anchor to adjust the rode. Timber is glued, bolted, or sometimes both depending on the loads and where this is done in the structure.The heat loads from these small areas is not significant.The welded strips are more compact than the perforated aluminum and block less of the insulation outboard. Could you not save the need for your large bundle of 4/0 cable running nearly the length of the boat by having a pair of deep cycle batteries in the forward annex to supply the winches and bow thruster? These are high amperage but low total use items and the batteries could be charged in between episodes of use with much smaller capacity cable. We want the alternators and/or genset with chargers to support battery voltage with the thruster. Higher voltage means more total thrust or cooler running at lower thrust levels, which means more run time.